Today’s the Big Day! | Keep It Up, David! I don’t have plans to celebrate the Mexican army’s defeat of the French in the 1862 Battle of Puebla. Instead, I’ll be spending my morning finally completing my 163-story stair climb fundraiser challenge! I feel like it’s taken forever for this day to get here, but, in actuality, it was only two months ago when I announced that I’d be climbing the equivalent of the Burj Khaifa (the world’s tallest building) on the StairMaster without stopping. I’ve done a lot of training since then, including an actual skyscraper climb in downtown Los Angeles, then had a setback and postponement when I fucked up my foot. But now I’m ready. And if you’re reading this after 11am PST on Saturday, then chances are I’ll have completed my stair climb.And I’ll have rocked it! If you’re looking for a recap, than you’ll have to come back Monday, because I’m actually writing this Friday evening, and I can’t predict the future! What I can do is share my final two training sessions. I used the StairMaster on both Monday and Wednesday, and both were great workouts. On Monday I climbed 116 stories in 30 minutes, and on Wednesday, I climbed 140 stories in 37 minutes – a new personal best! That’s two skyscrapers I can add to my Skyscraper Collection! The problem is that I’ve already exhausted most of the buildings on the planet that are over 100 stories, so this time I’m going to do something a little different. I’m adding more than one tower for each climb! ON THE LEFT: Four Seasons Hotel & Tower in Miami, Florida. It has 70 stories, and is the tallest building in Florida. It’s mixed use: there are offices until the 17th floor, the Four Seasons hotel from floors 18-36 (plus a lobby and pool deck on floor 7), and condos from floors 40-70. I’m not sure what’s on floors 37-39 – a mystery! ON THE RIGHT: U.S. Bank Center in Milwaukee, Wisconsin. 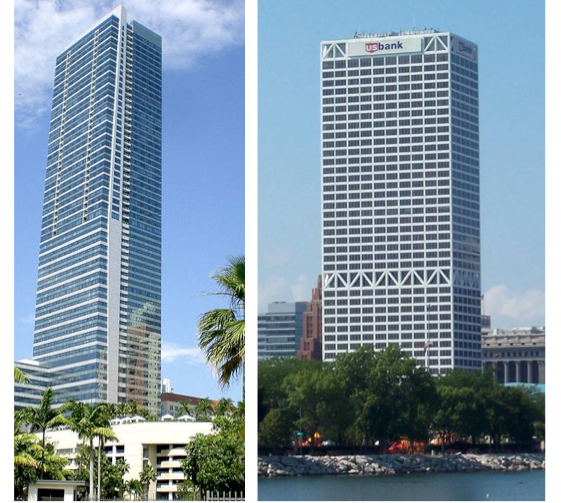 It has 42 stories, and is the tallest building in Wisconsin. The first Peregrine falcon chicks born in Wisconsin in over 25 years hatched in a nest atop the U.S. Bank Center in 1987, and since then, the rooftop nest has been home to 67 Peregrine hatchlings. ON THE LEFT: Carlton Centre in Johannesburg, South Africa. It’s 50 stories tall, and has been the tallest building in Africa since it opened in 1973. With the addition of this building, I now have skyscrapers in my collection from every continent except Antarctica! IN THE MIDDLE: The Westin Virginia Beach Town Center in Virginia Beach, Virginia. At 38 stories, it’s the tallest building in Virginia. The bottom half is a 4-star hotel; the top half are condos. 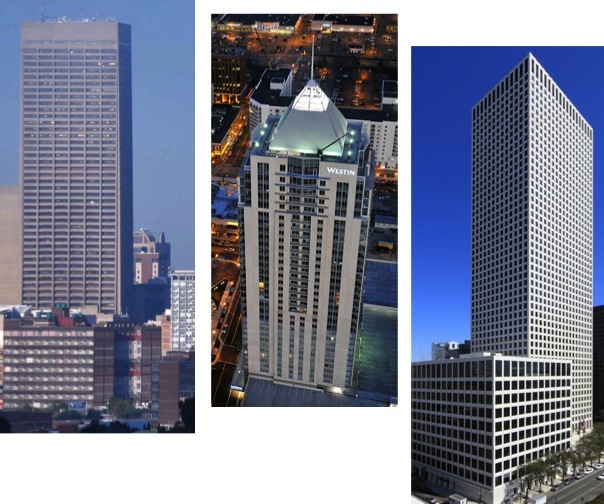 ON THE RIGHT: One Shell Square in New Orleans, Louisiana. At 51 stories, it’s the tallest building in New Orleans and the state of Louisiana, and it was the first building in the South to be taller than 200 meters. It faired well during Hurricane Katrina – there was only minor damage from blown-out windows and rain that entered the building. There you have it! The equivalent of five skyscrapers climbed in just two of my workouts! PS – Skyscrapers were all over the news this past week – didja see? It’s because 1 World Trade Center – also known as Freedom Tower – became the tallest building in New York City, surpassing the Empire State Building. Read about it here. This entry was posted on Saturday, May 5th, 2012 at 3:22 am and is filed under Uncategorized. You can follow any responses to this entry through the RSS 2.0 feed. You can leave a response, or trackback from your own site. 5 Responses to Today’s the Big Day! Thanks, Kyle! There’s plenty of buildings that came much closer to being finished as well! http://en.wikipedia.org/wiki/Chicago_Spire – They built the foundation before money went bye-bye. Since you’re probably done with your stair climb by now, allow me to give you a pre-emptive “Way to go, David.” I bet you’re exhausted and elated. My only question after reading today’s post: ARE there any skyscrapers on Antarctica? According to this website the tallest structures in Antarctica are 2 payload assembly buildings at McMurdo Research Station. Based on the picture, they look to be about 3 or 4 stories tall, but they’re big cavernous spaces used for giant balloon preparations. So I’d say NO. No skyscrapers on Antarctica!